Valencia CF have signed a new sponsorship deal with Germany's car manufacturer Volkswagen for the the 2015/16 season. 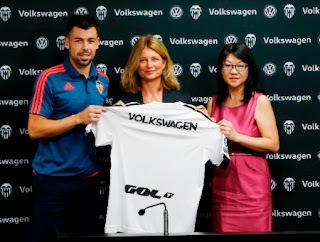 The agreement was made official in a ceremony held at Valencia attended by Laura Ros, CEO of Volkswagen Spain, and Layhoon Chan, Chairwoman of Valencia CF. This does not to seem to be a main sponsorship deal though, which means Volkswagen are not paying huge amounts and the deal in mostly for the advertisement at the stadium. We'll see, but from what I'm noticing it seems to not be the sort of main shirt sponsor type deal. Either way this is good news, as it means more money for Valencia CF and some decent exposure for Volkswagen now that Valencia CF is in the Champions league!